Get Organized, Save Time, Save Money and Aggravation - Get Rid of Clutter Using the 5S'Eliminate The Muda! Easy to understand and simple to follow, a proven method to creating clean and organized environments is available. 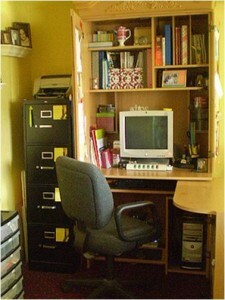 Recently JD over at Getting Rich Slowly reported on his ongoing effort to get rid of clutter. It seems it has been on ongoing battle for him as a result of “20 years of wonton spending and debt.” This never happened to me…. I wish! Americans have often been described as consumers but it seems that more times than not we buy but we don’t consume, we actually just accumulate. What is often frustrating about collections of stuff is all your stuff can slow you down. You have probably experienced it. In the kitchen, garage or even your closet; you know that “thing” is around here somewhere but you can’t seem to find it. You’ve lost your keys, your glasses, where is your book, you misplaced the bill; every day we waste time looking for things because of our disorganization. 55% of respondents to a study by The National Association of Professional Organizers found being more organized would save between 16 minutes and 1 hour each day. Every year thousands of people engage in the annual ritual called spring cleaning. How much sense does this really make? We spend hours clearing out the closets just so we can fill them up again? Einstein once said: “The definition of insanity is doing the same thing over and over but expecting a different result.” Are we all crazy? Why do we have to “spring clean?” It’s really not necessary; there is a better system to help keep things clean and organized. This system is called the 5S’s. Sort (Seiri) – When converting to the 5S method you being by sorting through everything in a given space or work area. Touch everything and make a decision: Is it necessary to this space? If so it stays, if not you must either relocate it, recycle it (sell it if you can! ), or simply toss it. If there is any doubt about the items usefulness but you can’t recall recent use, tag it in some way. Note the date, if a month passes without using it, do you really need it? Set In Order (Seiton) – Arranging your items in such a way that they are easily retrievable and ready for use. This might include putting the most commonly used items in the most convenient space. For example: placing a stapler, tape and calculator in the top drawer of your desk. In your walk-in closet this might mean having your winter clothes moved up front during the months they will be used. Sweeping (Seiso) – This “S” is about cleanliness and maintenance of your space and your stuff. Taking care of your clothes, tools and supplies reduces waste and ensures that your belongings are always ready when you need them. Following this “S” means that you don’t put away a stapler that has just run out of staples, and that you mend the hole in your trousers or sew the button back on your blouse before you hang it back in your closet. Standardize (Seiketsu) – Once you have eliminated the clutter, defined a specific location for your items and made sure that they are clean and in good condition you then make the effort to formalize what you have done. Standardizing in it’s simplest and most common forms would include labeling your files and file drawers and using dividers for the silverware in the kitchen. Why stop there? How about taking a picture of all your shoes and attaching it to the outside of the shoebox enabling you to find exactly what you want quickly? Establish specific locations for your tools using shadowgraphs or outlines so that when removed anyone can tell where they need to be returned. Sustaining (Shitsuke) – The most difficult of the 5S’ to fulfill this is about promoting the previous S’ ongoing. After going through the effort not only to clean but to organize and establish standards most will follow through. The greatest challenge is getting others in the same environment to do the same. By getting their buy-in at the beginning and engaging them in the process you’ll significantly increase your success. In the early stages it is imperative that we hold ourselves accountable. Focus on nothing else for the first 60 day but making sure that everything removed is replaced to its designated location and soon your new habits of organization will prevail. 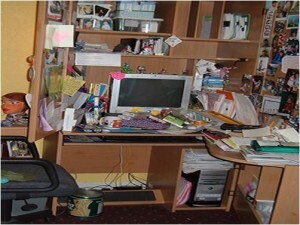 What tricks do you use to maintain an organized and clutter free home or work environment. Please click on the link for comments and share your ideas. Good Post! I find this very helpful in terms of getting organized….Something I do to make my life easier..
-I do my major cleaning and laundry on a given day (for me that is Weds night) I do this so my weekend is free. This has helped me out a lot! when buying winter clothes, i always chose wool because i love the feel of it’..
Simplify Your Life With Visual Controls « Eliminate The Muda! If The U.S. Government Read Personal Finance Blogs « Eliminate The Muda! Meeting and Event Planning « Eliminate The Muda!